As a City, we want everyone to have access to healthy foods. We have partnered with community groups and City and County departments to help residents access healthy food close to where they live. 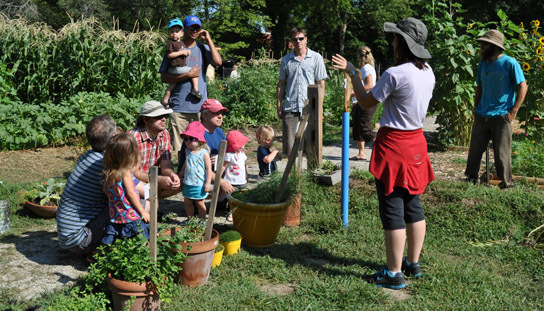 Common Ground Community Garden Program: Common Ground is a community gardening program. The City leases vacant or underused land for free so that citizens can grow food. People who use the land are required to donate some of what they grow to community members in need. In 2016, producers donated 6,500 lbs to the community. Urban Agriculture: The City passed an Urban Agriculture Ordinance that expands access to healthy food and allows for some commercial production. Residents can now have larger home gardens and gardens in front yards. They can also raise small animals at home. Food System Plan: The Douglas County Food Policy Council spearheaded a Food System Plan which was adopted by the City and County Commissions in 2017. The plan recommends how the local food system should develop and how to enhance agriculture in Douglas County. Double Up Food Bucks: Double Up Food Bucks matches SNAP (food stamps) dollar-for-dollar at regional farmers’ markets. This means that residents who use SNAP can double the amount of local fruits and vegetables they can buy. Culinary Commons: Culinary Commons is a kitchen that anyone in the community can use for a small fee. The kitchen is clean and quiet. It can be used to cook for large groups, help launch a food business, or innovate to perfect products. Gardeners gather at the Garden Incubator at John Taylor Park, one of the many community gardens that make up the City’s Common Ground program.